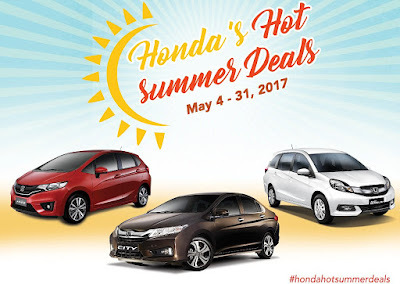 Honda Cars Philippines, Inc. (HCPI) announces the hottest Honda deals customers can get this summer. Customers may avail of exclusive discounts and low down payment offer by purchasing any Honda vehicle from today up to 31, 2017. For the month of May, customers may avail cash discounts of as much as P 70,000. The New City customers will also enjoy free Daytime Running Lights (DRL) on top of their cash discount. The CR-V is also offered with big discounts together with a choice of Modulo Aero Kit or Modulo Trekker kit accessory package. To further add excitement this summer, HCPI will also offer low down payment methods and bank financing promos for as low as P 20,000 down payment for the Jazz 1.5V CVT and P 21,000 low down payment for the Mobilio 1.5 V CVT.